Our Vintage Etsy Shop is Freshly Stocked! Running my vintage Etsy shop is a lot of fun (and, surprisingly, a lot of hard work! ), but it’s been really rewarding. I enjoy connecting with fellow vintage collectors and seeing photos of the goodies I’ve sold in their new homes always makes me smile! I don’t talk a lot about it here, but I wanted to pop in and mention some new items in store. I let the store get pretty empty this spring while I decided what to let go of and sell locally. I don’t want to be those people who hangs on to something for years, waiting for the right buyer, so I did some local sales, slashed prices and sold a lot of inventory. It helps keep things exciting! Recently I photographed some fresh finds and have re-stocked the shop. I’ll be listing more and more, but the nearly 50 items we have now is a pretty good start. Here’s a peek at what’s new – including some of my favorites. 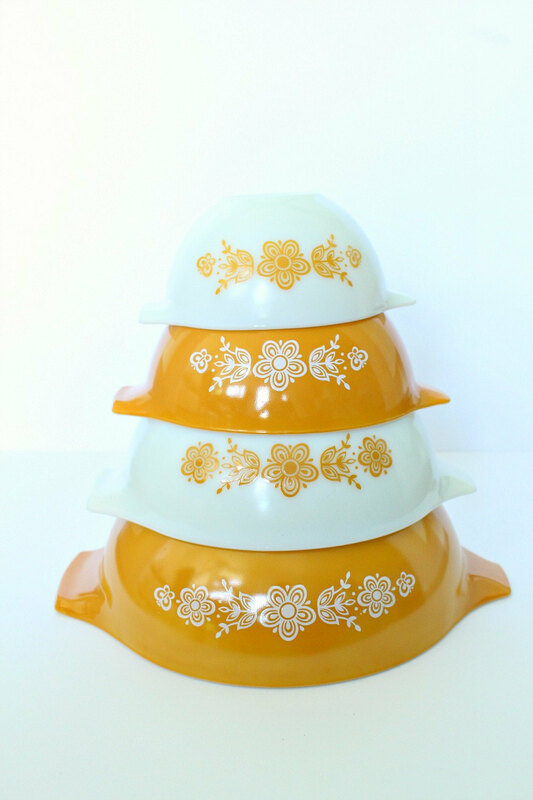 I love this set of Butterfly gold vintage Pyrex Cinderella mixing bowls (UPDATE: SOLD) but I’ve seriously downsized my Pyrex collection in the last couple of years. I had some big sales on Instagram and sold a lot locally. I’m hoping to find this set a new home! I also have some fridgies for sale. 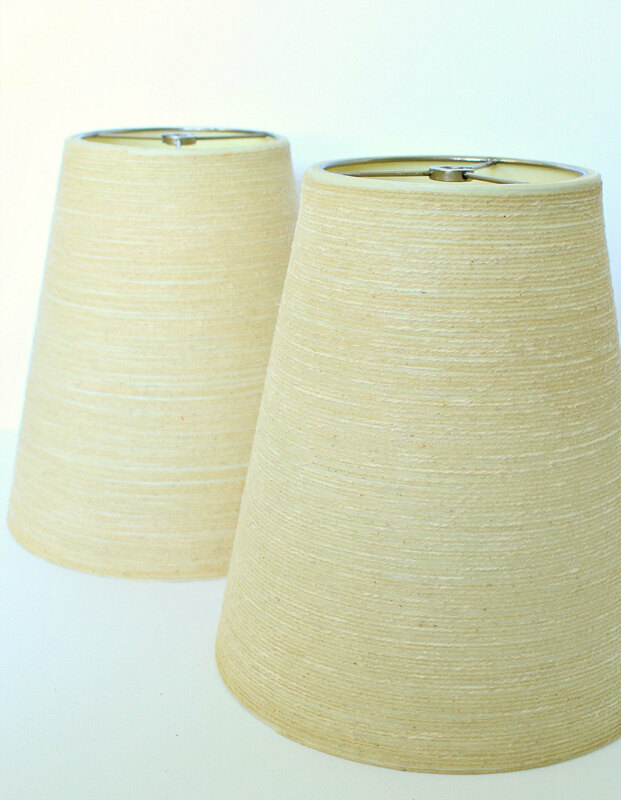 When I spotted this pair of Lotte fiberglass and jute lamp shades I was so thrilled. Once I got them home, I realized they’re too small for my yellow Lotte lamps! Womp, womp, womp. I know these will make some Lotte lamp collector VERY happy, although I’m so, so nervous about shipping them! (UPDATE: SOLD). With the living room Besta dismantled, my vintage McCoy pottery collection has been displaced! The pinks went to my Mom, the creams are currently in the basement, and I’m slowly spreading the turquoise ones around the house. A few pieces, including these green basket weave planters and also a gorgeous yellow McCoy planter, have found their way into the Etsy shop! There MIGHT be some really great turquoise ones that find themselves in need of a new home, so favorite the shop to be the first to know. (UPDATE: SOLD). Do you remember the start of my FAB trays collection? I loved the history of these kitschy Canadian-made resin trays. I ended up collecting quite a few, but since moving to the lakehouse I find myself short on space! 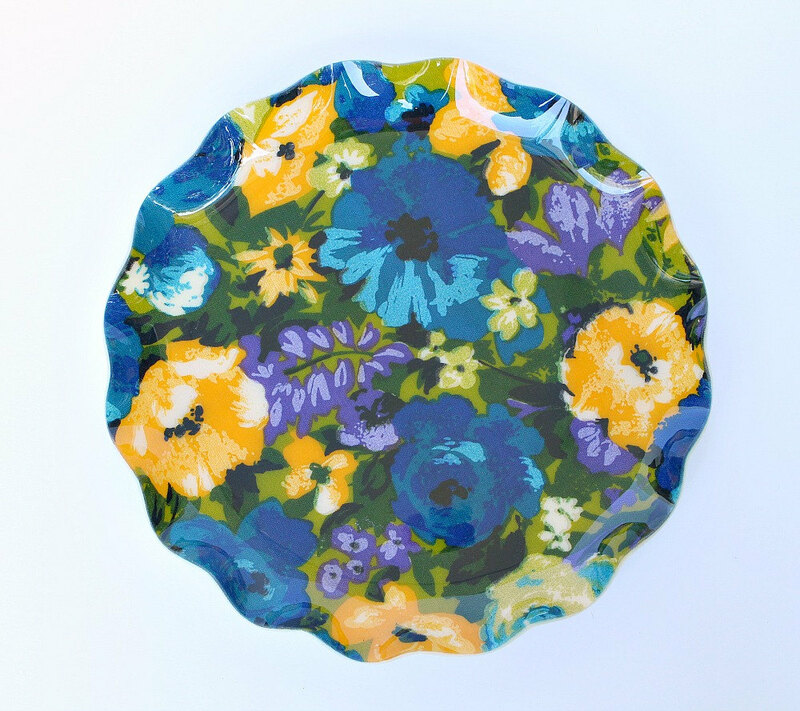 Any new trays I find are shop-bound and even the aquas and blues (gasp) are up for grabs…like this one! (UPDATE: SOLD). I will be listing some more jewelry, too – including a stunning Baltic amber necklace. Ack, it’s so gorgeous. 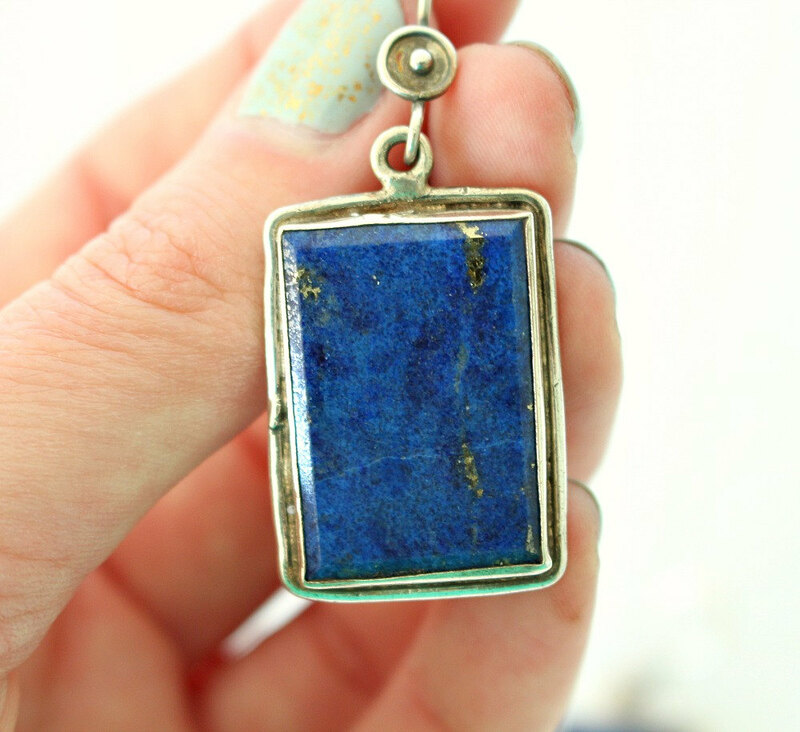 But these huge Lapis Lazuli earrings (UPDATE: SOLD) are pretty darn stunning too – look at that gorgeous veining. Drool. 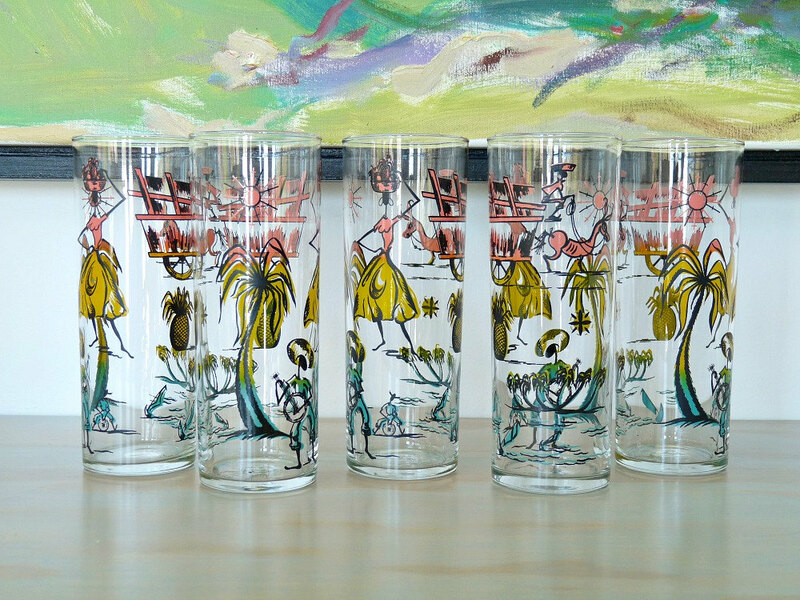 SO shocked these Caribbean themed high ball glasses have not been scooped up yet (UPDATE: SOLD). They are one item I could not part with in the big spring purge. I am seriously in love with them and every day I’m tempted to deactivate the listing. This aqua vase was made in Canada! 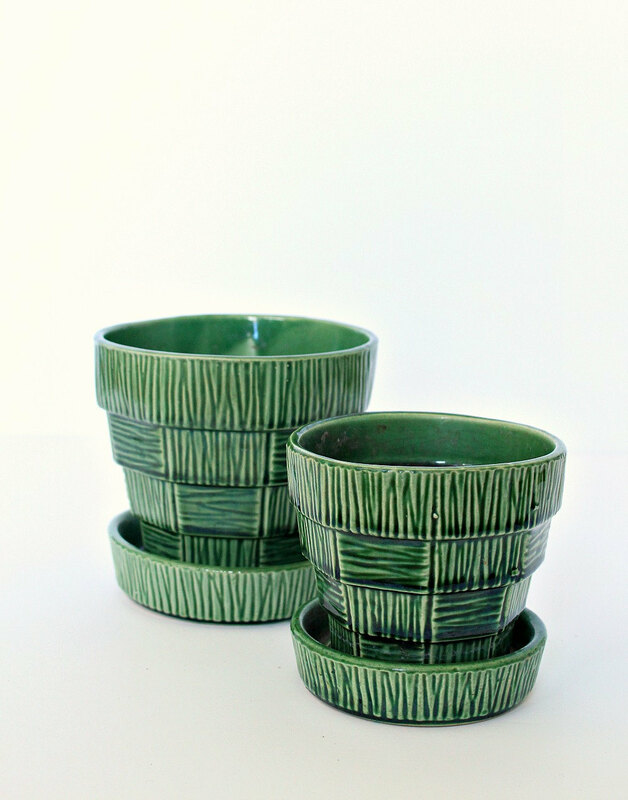 I just love the subtle glaze at the top – it pairs so well with the soft, minty-aqua hue. (UPDATE: SOLD). I have vintage dollhouse furniture for sale! I always meant to make a cute vintage dollhouse so I scooped up some pieces from a local antique seller. But really, the kids will be asking me for help applying to university before I get a dollhouse done. With so many folks making them these days, I thought I’d release these back into the wild. I’ve got a pink bathroom dollhouse set for sale, retro plastic dollhouse arm chairs, plus a brass miniature dollhouse furniture set with a birdcage (UPDATE: SOLD) – complete with mini bird inside. 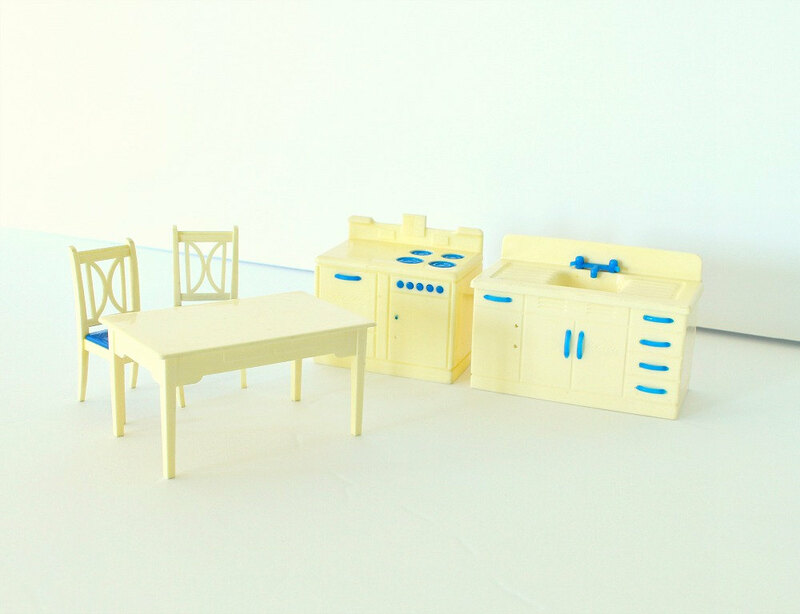 The last photo of this listing for dollhouse kitchen appliances (UPDATE: SOLD) has a photo with the set in use – too cute! 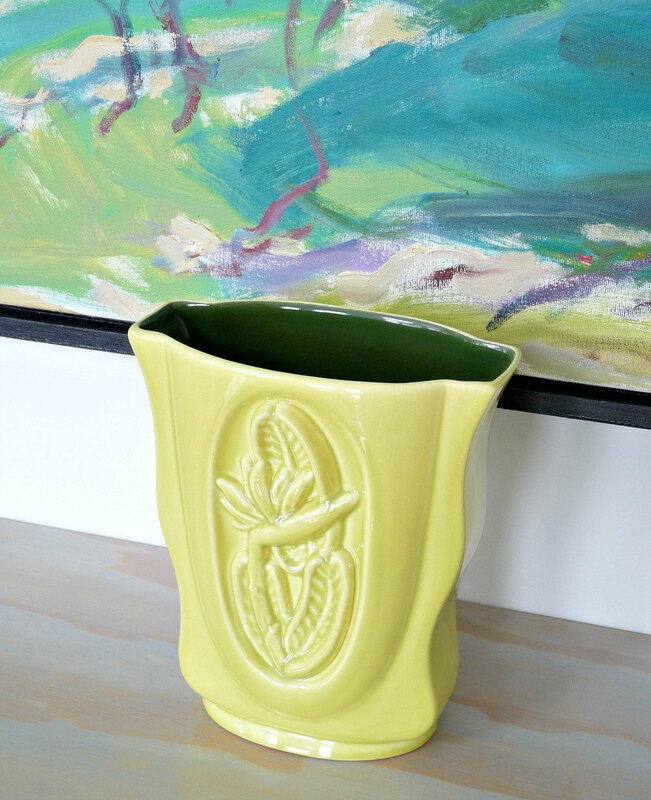 I lowered the price on this green Red Wing pottery vase (the design is Tropicana Bird of Paradise). 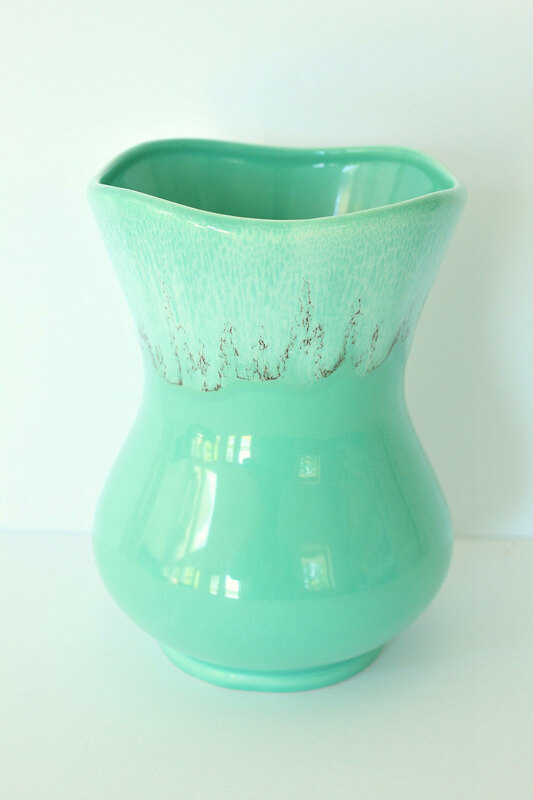 I love this vase so much – the emerald green interior is so clever, because it hides discoloration from flower water. Somehow I ended up with quite a few petite figurines, but they’re all so adorable! 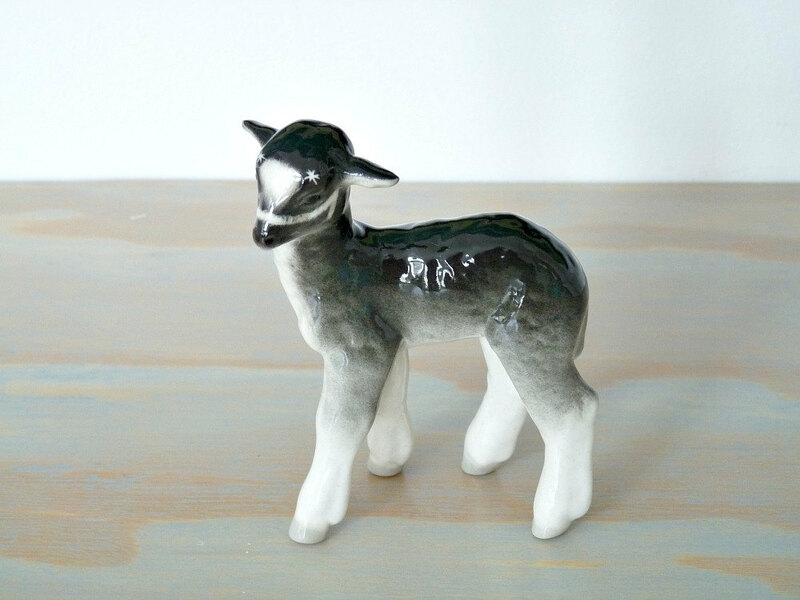 This little goat would look so cool tucked into a larger planter or terrarium for a little quirkiness. (UPDATE: SOLD). Check out the rest of the shop inventory here, and favorite the shop on Etsy to get a first look at the new things I’ll be listing soon! If you collect anything or are on the hunt for something special, let me know because I’ll be happy to keep my eyes peeled for you – just leave me a note in the comments with your wish list. So happy to hear you've found some great things on Etsy!Our reason for considering closing down the shop isn't so much to do with business, because we've been happy with our sales online and off – where we've sold a lot more. It's just that the vintage re-sale market is pretty flooded. There are so many re-sellers locally and it's just getting so cut throat! We've considered switching gears to handmade items, maybe a mix of the two? We're not sure. We just want to keep it fun! We'll keep doing it as long as it's fun. You have lots of cool things in your store! Several of my friends are trying to talk me into opening an Etsy store to sell the beaded jewelry I make. Up till now, I've only made it for myself and as gifts. Like you, I only want to do it if it's fun. Right now, I thoroughly enjoy making things for myself. I don't know if it would be as much fun if I thought I had to do it for a store. I love the jewelry you make (from the glimpses I've seen – I remember you pinning some pieces you made, or did I spot them on Instagram?). I would also be inclined to encourage you to open a shop! But I completely understand your desire to keep it fun and keep it for yourself.